OTech: Tales of a road warrior: don’t lose your passport. Tales of a road warrior: don’t lose your passport. I noticed I was missing my little pouch with my travel documents, including my passport. I must have looked somewhat frantic as a gate assistant from American Airlines came over to me and told me to take it easy, move to the side and take everything out of my bags and pockets to search for it. Apparently this was not the first time she had seen such panicky searching and, I have seen it myself in other travelers, always thinking to myself that this will never happen to me, because I am so organized, but now it was my turn. After taking everything out of my bags and going through it a couple of times I was increasingly getting a sick feeling in my stomach as it became clear – my black travel pouch was missing. I remember distinctly that I opened it in the taxi to double-check my fight departure time, therefore, I must have lost it between that event and arriving at the airport kiosk. The most logical explanation would be that I left it in the taxi from the hotel to the airport. Fortunately I had gotten a receipt, which had the cab company phone number, so I called the company. I explained to the dispatcher that I had left my passport in the taxi and he immediately blasted a page to all his drivers asking who had dropped a passenger off at the airport in the last 10 minutes to check their cabs. He promised to call me back immediately when he heard something. I waited 15 minutes without any sign and called him back. I explained that I was stuck, could not get anywhere without my passport and if he would please page his drivers again. I waited another 15 minutes without any sign and I called him back. At that time I was getting close to the boarding time of my international flight and getting pretty anxious. I told them I would give the driver an extra $100 if he would return it ASAP. Nothing happened. At that time I had to make a plan B. Option one was for me to fly back home to Dallas and wait until it showed up. That meant giving up the trip to India, where I was to deliver a keynote speech and a one-day training class for a healthcare technology company. If the passport did not show up, it also meant cancellation of an international training course a week later as replacing my Dutch passport with US resident card and applicable visas for the countries I was going to visit was going to take at least a month if not longer. And by the way, our upcoming mini-vacation to Belize was potentially endangered as well, something I am sure my spouse would not have been too happy about. Option two was hanging out close to the airport and potentially going one day later assuming it would magically show up. I chose the latter, walked up to the airline counter and they were able to hold the ticket, and cancel the outgoing leg for now. I walked over to the airport hotel which could offer me a room for a mere $375 plus tax. After checking in, and unloading my luggage, I talked with my previous hotel just in case I had left it there. I remember I had my pouch with me in the bathroom in the lobby before picking up my luggage, which was in storage. They put me on hold, sent someone to check the men’s bathroom and came up empty handed. I left my cell number just in case. I also had to notify my contact person in India to not expect me at the agreed upon time and sent an email that I was stranded because I had “trouble with my travel documents.” I walked to the airport once more backtracking all my steps and trying to find anyone who might have seen the pouch, but everyone had left by that time. There was nothing better to do than to raid the minibar in my room for cognac and chocolate (another $30), and go to sleep. I did not sleep very well, trying to reconstruct everything in my mind over and over again. I felt that if it had been left in the taxi, the cab driver most likely would find me to return it. There was no way for me to locate the specific taxi since I had paid cash. As a matter of fact, the first thing the taxi dispatcher asked me is if I had paid with a credit card, as it apparently shows the cab number which would have made it easy. I typically pay with credit card but in this case, I did not as I felt sorry for the guy and I know that he would have to pay 5 percent of the fare for credit card charges. The good news was that this taxi driver seemed to be a non-typical Chicago cab driver. From my experiences over the past few days being in that city, the Chicago cab drivers are the world’s second worst, after Brazil, which I will explain in a second. A typical driver seems to need to talk continuously in a very loud voice on his cell using those earpieces in unidentified languages, which may have been either Swahili or some other African language. They will never leave their seats, but do charge for extra luggage that I have to put in the trunk by myself. Of course, the first thing I do is put on my seatbelt, as their driving is kind of reckless. Incidentally, the worst cabbies are the drivers in Sao Paulo, especially during soccer matches, which seem to be going on continuously. They have tablets mounted on their front dashboards allowing them to watch games while driving. Talk about being distracted by talking on a phone; imagine being distracted looking at a TV screen while driving. So, the first thing I noticed about my taxi driver that night was that surprisingly he was not on the phone, so I could have a decent conversation. He told me pretty much his life story, how he was originally from Palestine and was able to get out at a relatively young age. He came to the USA through Amsterdam and had subsequently gotten citizenship, settled, and had a family. He also told me about the recent unfair competition from Uber, which provides rides without needing to comply with any of the regulations he and his 10,000 or so colleagues have to deal with such as regular drug tests, car inspections, driver tests and many other rules. His base cost to make any money is about $150/day and to make a decent living, he needs to work 12 hours/day and 7 days/week. Having heard all of this, I paid him cash, but was now faced with the fact that I had to locate him among 6,000 + taxis in this city as I did not have any record of him. After little sleep, I went back to my mission to locate my passport at eight o’clock the next morning. I called the taxi company again to tell my story and ask the dispatcher to send a message to his drivers again as they might have found it by daytime. He asked me the color of the cab, upon which I said that I thought it was yellow. Ah, he said, that is not us, we are white/blue. The receipt I had in my hands was clearly from his company, but he explained that drivers swap receipts all the time and as his company does not provide free receipts to their drivers, it was almost certainly from another company. I looked on-line for taxi companies and started calling them. When I made the second call, the nice lady on the line told me that she just talked with me, as apparently taxi companies outsource their “lost and found” so she gave me the list of the companies they cover which were six. After that, I thought it might be better to go back to the airport and do more checking there. The gate agent was nice, she checked her area and nobody had found a passport. She told me to check with the porters outside, who had not found anything either. Then she sent me to the local “lost and found,” close to the lost luggage desk. An AA agent was accompanying me to the innards of the airport, which was helpful as the lady in charge had a very difficult-to-understand east European accent (probably Russian). After discussing at length among themselves the case of the agent’s missing walking shoes, which by the way the Russian lady had not found, we finally got to the topic of my lost passport and indeed she had not gotten anything in this morning. After leaving my cell number at yet another location, I decided to try to locate the cab company again. 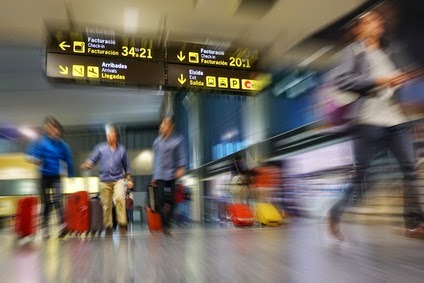 I situated myself inside the arrival hall where I could see the taxi line and tried to look for cars that were yellow and of the same type of the car that I remember I had used the night before. After 15 minutes or so I had become quite an expert on the different taxi companies, finding out that most companies have similar car types and that there are many more companies than I had found on-line. So, I was diligently writing down the numbers of companies that matched the car type and color as I recalled from the night before. Then I got a call on my cell from the hotel that I stayed in prior to my loss. They had gotten a call from the driver. I asked the front desk to call him back and yes, I got to talk with him. He had found my pouch on the floor in the back of his car as he was cleaning it up for his morning runs and also found my hotel information in there. I immediately took down his number and gave him mine. My prayers were answered… I asked him to drive back to the airport and deliver it to me in the lobby. I did not mention that Johanna, my spouse, has a good friend Diana, who is very intuitive and has the capability to see what others don’t easily see. In any case, she had texted her at night to ask for any clues and she told me that she clearly could visualize a bathroom, and something like my pocket pouch and dropping it. Based on that information, I had called the hotel, which was able to make the connection when the taxi driver called them. So, after anxiously waiting an hour in the hotel lobby he showed up in his taxi, which by the way was not yellow but white and blue (amazing how few details you remember from the past, especially when it is dark). I gave him his cab fare and an extra $100. I took several deep breaths, called the airline which was able to reschedule the departure to that evening for a “small” fee difference of over one thousand dollars, at which point I really did not care as long as I could fulfill my commitment to my client. I left that evening, traveled for about 24 hours, arrived at the final location to check in to the hotel, get a half hour of sleep, took a shower and showed up to work. They had postponed my talk and I was just in time to deliver it 10 minutes later and do my training a day later as well. At one point in time my contact person asked what really happened and I told him some of the details, fortunately they were able to reschedule everything without much trouble. There are a lot of good and reliable people in this world, and fortunately of all the cab drivers I meet, I happened to meet one of the good ones on that trip to the airport. Running around like crazy is not always productive, this was a clear signal for me to slow down. Unfortunately, this was kind of a stressful situation but not having my passport was most likely the only way that the universe was able to slow me down. Always be prepared with a plan B in case something happens when traveling, something I learned a long time ago. Don’t get too stressed out or upset as you are not in control, especially when it relates to travel. Look at events in a positive manner, it could have been much worse. I was able to fulfill my commitment to the customer. To reward myself, I treated myself with an upgrade using 15,000 miles to fly business class on the leg coming back from London to Dallas. Always pad trips, for example, when flying internationally build in an extra day to spare in your schedule. Travel with awareness, take down taxi numbers, and pay with credit card when possible. Be prepared to lose anything, leave business cards in them, make copies of important documents and/or take a picture with your phone. So, while I am recording my experiences on this flight back home, I am getting an extra glass of wine and feel blessed to be able to do what I love and like, traveling and teaching while being able to spend a decent amount of time with my family. In the meantime, I am looking forward to my next travel adventure. Losing your passport when you are traveling abroad can be a great hassle! Thanks for the advice.